Home › Blog › ARC R8S 1/8th Electric Power Stock Class Pan Car coming soon @ Quantum! ARC R8S 1/8th Electric Power Stock Class Pan Car coming soon @ Quantum! The new ARC 1/8th electric power pan car is the latest category in the 1/8 On-Road class. It uses the same body shell and tires like the existing 1/8th On-Road chassis platform. This new and innovate design makes R8S to be able to use different Li-Po batteries on the market. Drivers can chose 2S stick style packs, or 2S shorty style packs. This configuration can install battery packs horizontally flat in order to lower the center of gravity, or to install the battery packs vertically standing in the center of the chassis. 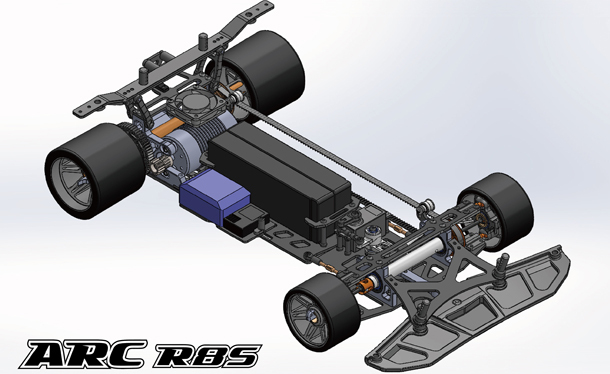 The chassis can also be installed with a 4S pack, there are 5 different battery configuration can be use in R8S , The flexibility of different battery layout provides different weight distribution options to achieve top performance. With the none-independent suspension design, the R8S provides easy maintenance and yet still retains many flex joints that allow fine tuning for different track conditions and handling. The R8S will be available in August, 2018.